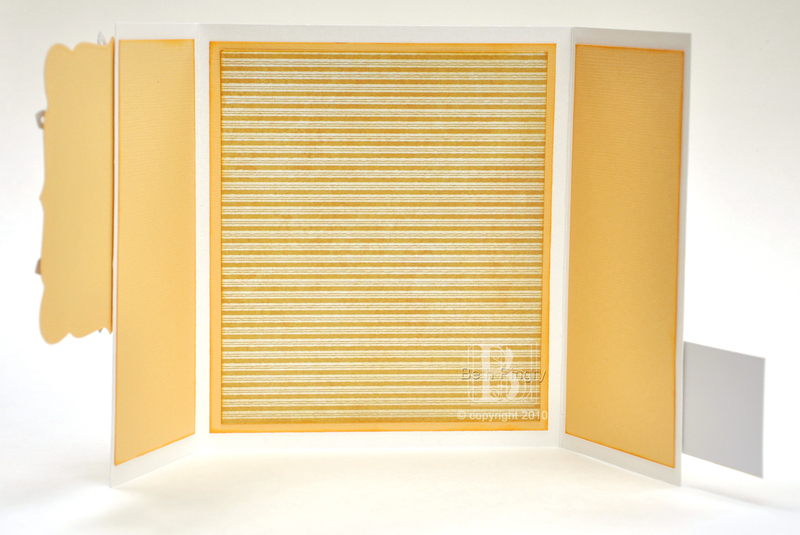 I’m up on the Crafty Power Blog at Scrapbook Adhesives by 3L® today, with this card. 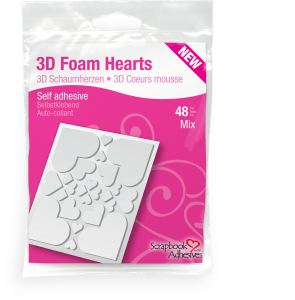 It features the technique of “Wear Your Adhesive on the Outside” with the 3D Foam Hearts. I’m way behind on sending thank you cards. My excuse is that I refuse to buy them in a store, and even if I do, I get the “where’s my hand made card?” response. I took some Saturday time to make cards, which are still sitting here because now I need stamps. Anyway, using the Grand Calibur™ and new Spellbinders™ die templates I whipped out a bunch bouquet of cards assembly line style. 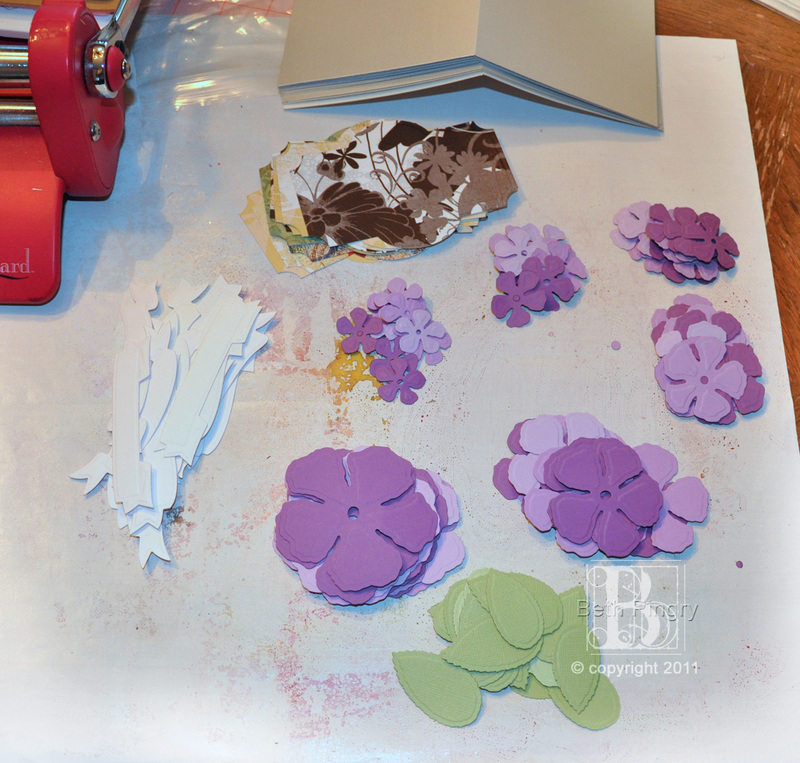 I was determined not to dip into my 12×12″ papers, but to use up scraps. I have a ton of purple Worldwin cardstock, Basic Grey (I made an 8×8″ album for a friend and have so many scraps) and I got a great deal on these ‘Thank You’ rub-ons when a store went out of business. OK, so I had to cut the card backs, but that doesn’t count, right? 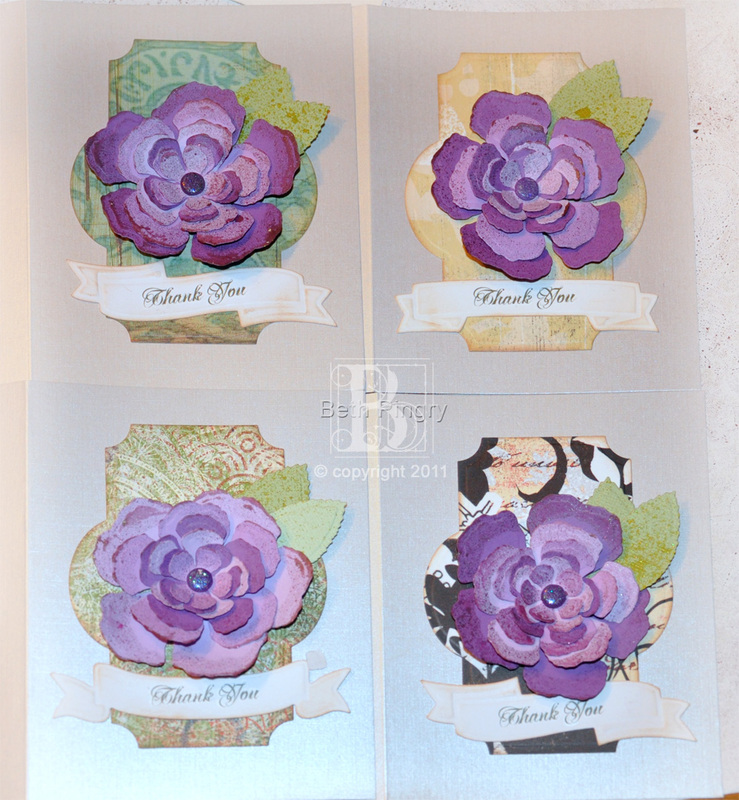 Real quick – this is how to make a dozen cards with scraps and the Grand Calibur. 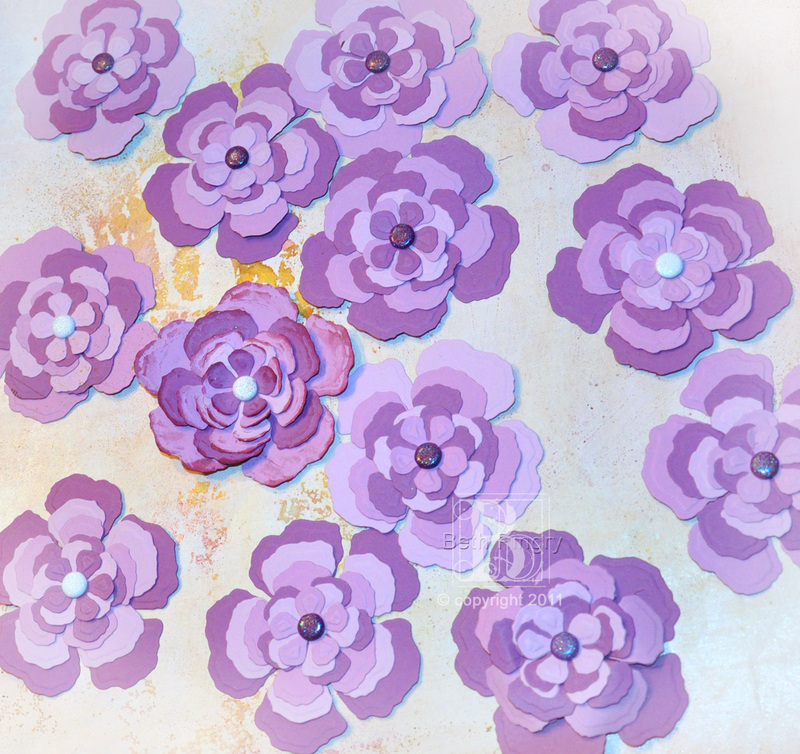 The die templates I used are new Spellbinders S5-024 Labels Twenty-One; S4-324 Ribbon Banners and S5-050 Rose Creations. Rub-ons are older Reminisce, and the card backs are Worldwin cover stock, and Glimmer Mist in Haunted Shadow and Apple. Since I had room, I cut 4 of the Banner Basics in each pass, I just love them and they’ll be good to have on hand for another project. Next step, assemble the roses. 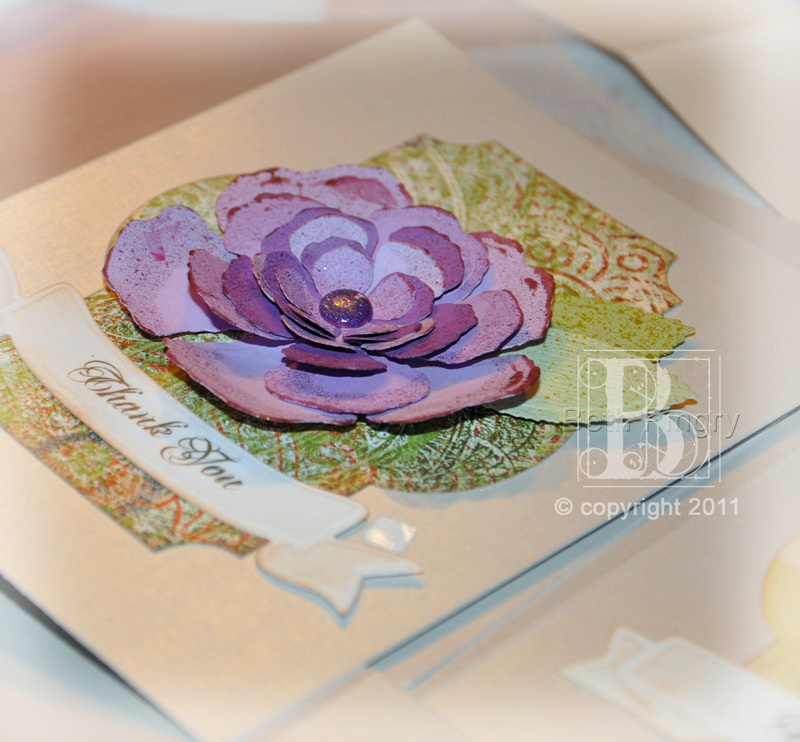 I mixed and matched the purples and used sparkly brads from Creative Impressions. The leaves, labels and banners were edged with an ink pad. The leaves were also spritzed with Glimmer Mist. The flat flowers were not working for me. 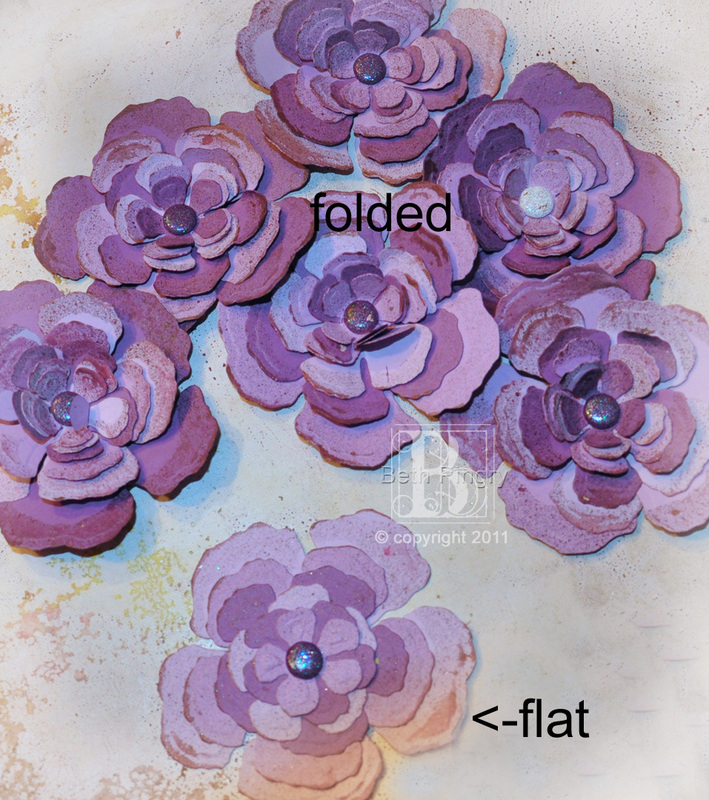 I folded the petals up and in to give the flowers some dimension. 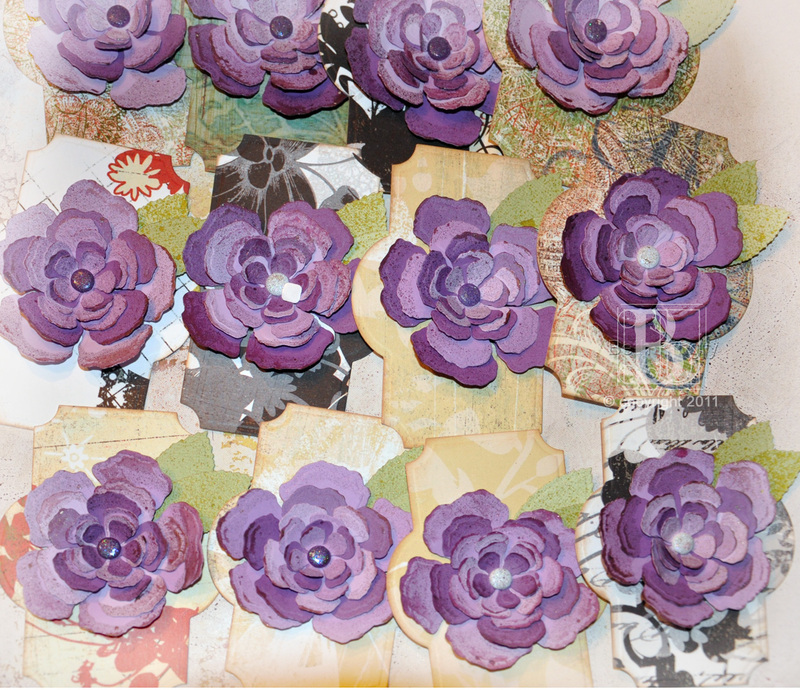 Then I sprayed some purple Glimmer Mist onto my mat and tapped and dragged the edges of the flower. This is quick and there is no reason to fuss about perfection in this step. See, it makes a huge difference and it doesn’t matter if they are all slightly different. I pushed the brad through the labe to attach the rose, then used SCRAPBOOK ADHESIVES BY 3L™ 3D Foam Squares on the leaves and MyStik™ Mounting Squares to adhere the labels to the cards, and the Ribbon Banners on top of the labels. Each rose and label is different, but that’s ok, nobody will know but you and me! And nobody will know that I used up some stash very nice paper! They’ll just be shocked to actually get something from me!! I’ve got a post-n-run (or not run) today. 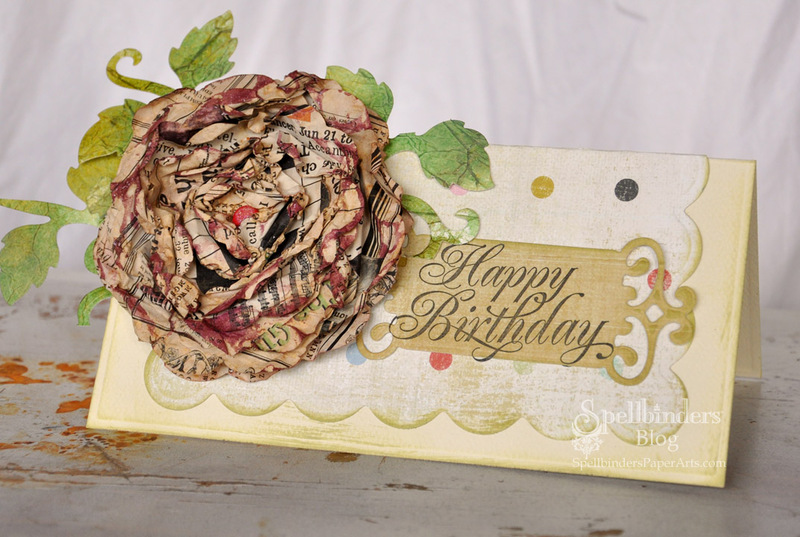 Here’s a birthday card I put together in a jiffy for Stacey Caron’s birthday on the Spellbinders Blog today. The base is from Grand Squares, the distressed flower is newsprint patterned paper spritzed with Glimmer Mists, and the polka dot paper is from Fancy Pants Designs, Delicate Dots cut/embossed with Grand Scalloped Squares. The Fancy Tag is the opposite side of the same paper. The leaves were from leftover paper from my Altered Purse project on SCRAPBOOK ADHESIVES BY 3L™’s Blog, and cut/embossed with On The Vine in my Grand Calibur™. 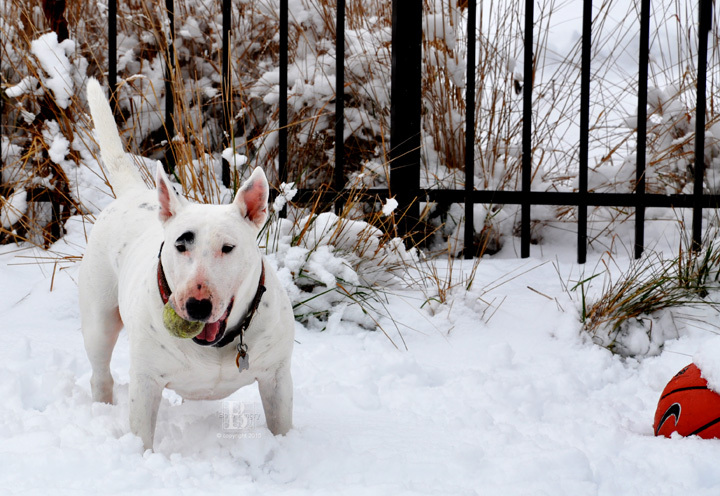 So when your 9-year-old nephew hassles you to post on the blog, (Sup, dawg?) you know you’ve been a little behind. So I do apologize, Here are my top 10 excuses. 2. 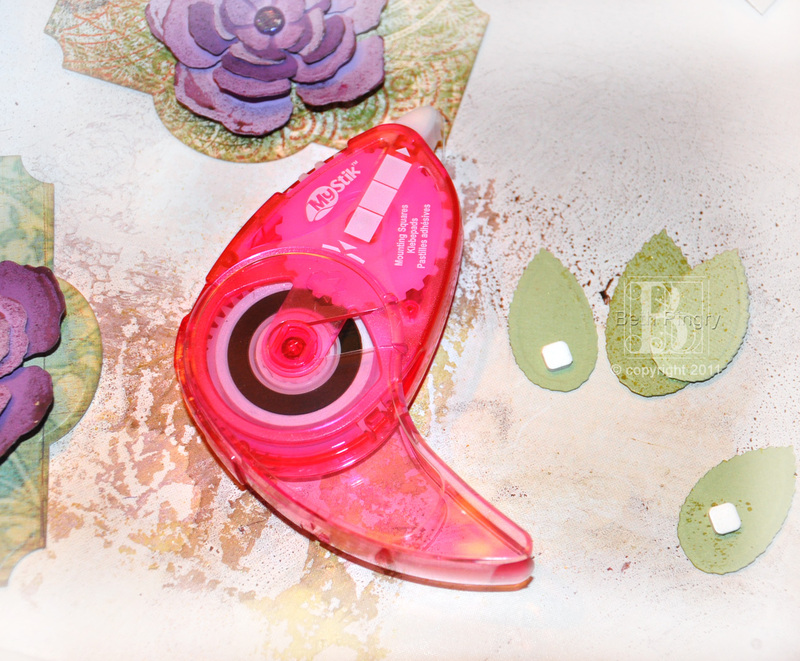 Crazy-busy CHA Prep with Spellbinders – don’t miss the Sneak Peeks next week!! This is the BEST collection we’ve ever had. Seriously! 3. 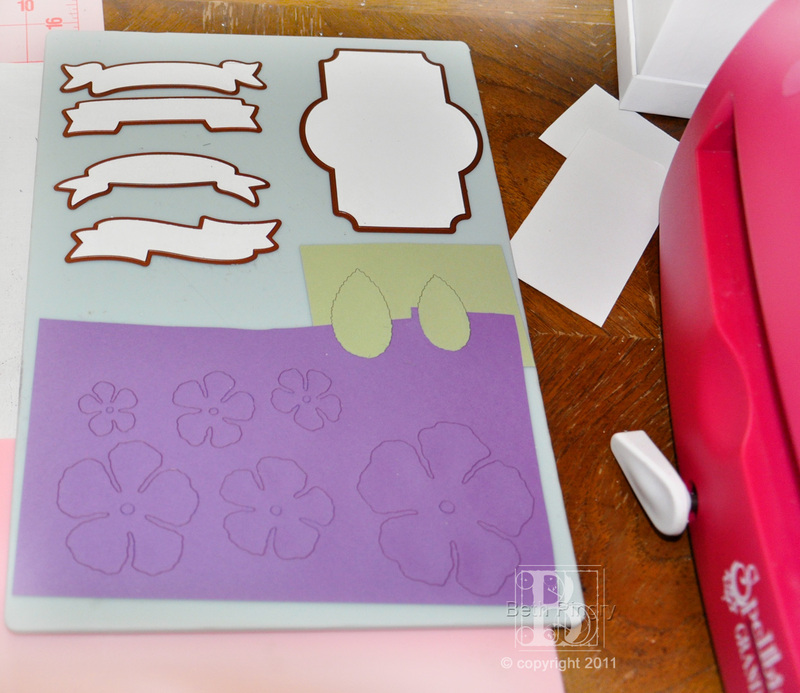 Crazy-insane-busy big project with Spellbinders. 4. Hour long visits for Chiro/PT so I can get back on the treadmill and faster than 3.6. Who knew I was so messed up? And could someone find my metabolism? 5. Did I mention crazy-busy? 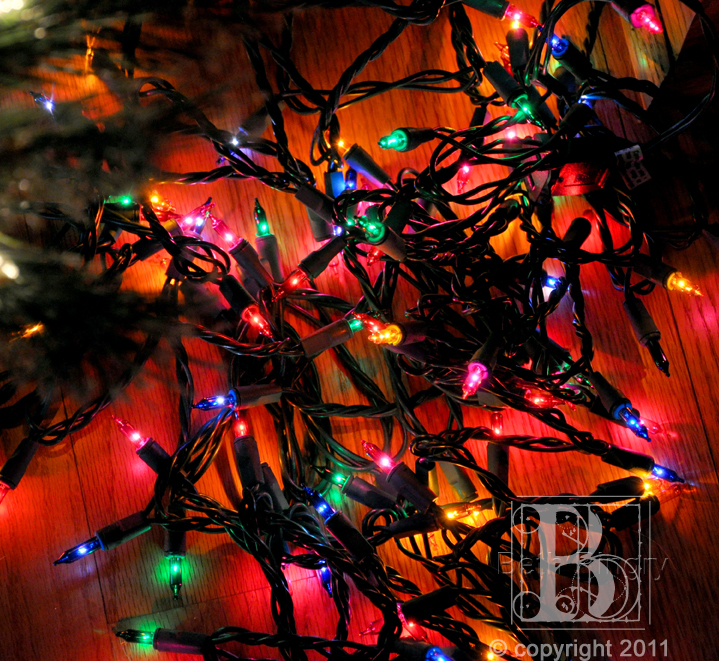 Can I get some volunteers to un-deck the halls? Or should I leave the Christmas trees up until February, like last year? 6. Mountains of laundry, organized unions of dust bunnies, and other random distracting items. No photos, too scary! 7. 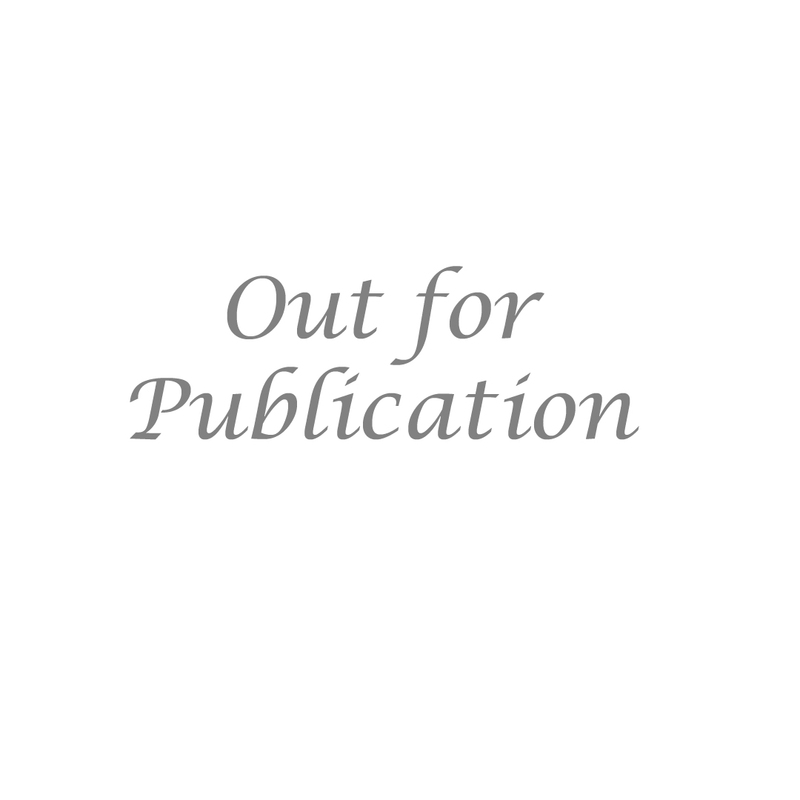 A new website for my blog. Yeah, DH got me all set up and I started fussing and now I’m kinda stuck in decision-making paralysis on a few things. I know, just do it and keep fixing as I go along. When I get a spare moment of sanity, I will. Be gentle on me! 8. I just can’t decide on my OLW. Not that I have made it past a few days, but it seems like a good idea. So far “DUH” is the front-runner. 9. Couponing. 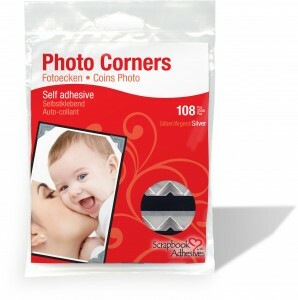 Is it worth the 2 hours of time setting up my store card, printing and clipping coupons, to spend another 2 hours in the store making sure I’ve got the right products and sizes, to save $15? I love the thrill of saving $$, just not convinced its worth the effort or time involved. 10. Girlfriend. She’s like 55 in dog years, according to the chart at the vet, but she is still acting like a silly puppy! Such an attention hog! But she’s not as fat as I expected (a round 58 lbs) while remaining significantly happy. If you’ve been searching for a perfect set that could give class and elegance to your Christmas gift packaging, search no more! 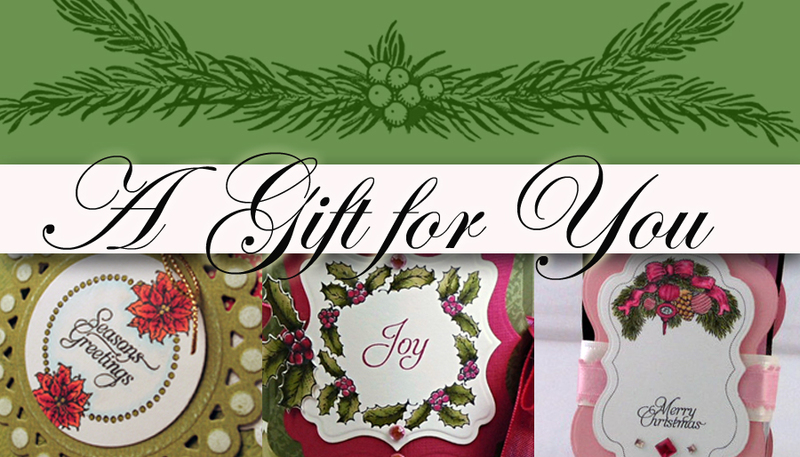 Today, Flourishes is sneak peaking a brand new set called, A Gift for You, and some of the Spellbinders™ team is joining them in the fun! 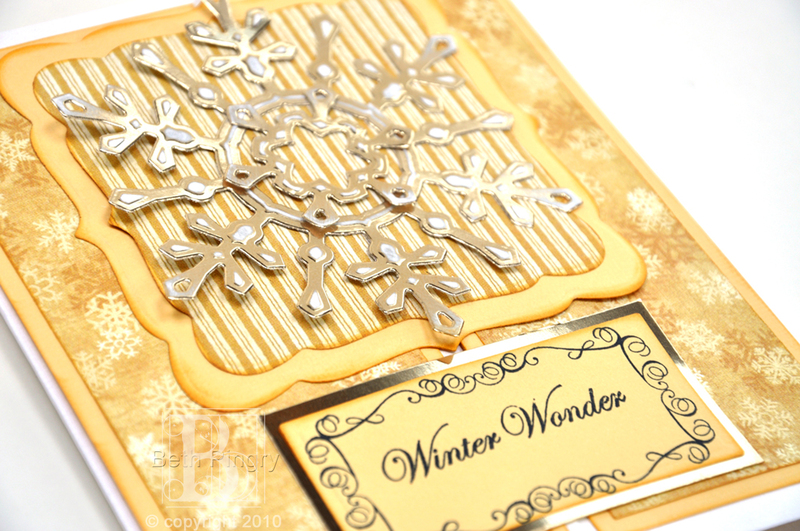 This set was designed not only to coordinate with some of Flourishes best-selling Christmas stamp sets but with more than a handful of Spellbinders Die Templates! A Gift For You – drawn by the ever-so-talented Marcella Hawley – offers 8 different tag styles and 8 different mini sentiments to fit inside! To make sure your tags come out with a regal style and design, this set coordinates with Spellbinders Labels Fourteen, Labels Fifteen, Labels Sixteen, as well as some of the new Decorative Nestabilities® designs like Lacey, Eyelet and Beaded Circles and Lacey or Eyelet Squares! The customizable options are endless. Would you like to win this set? Simply leave a comment on Flourishes’ Blog! 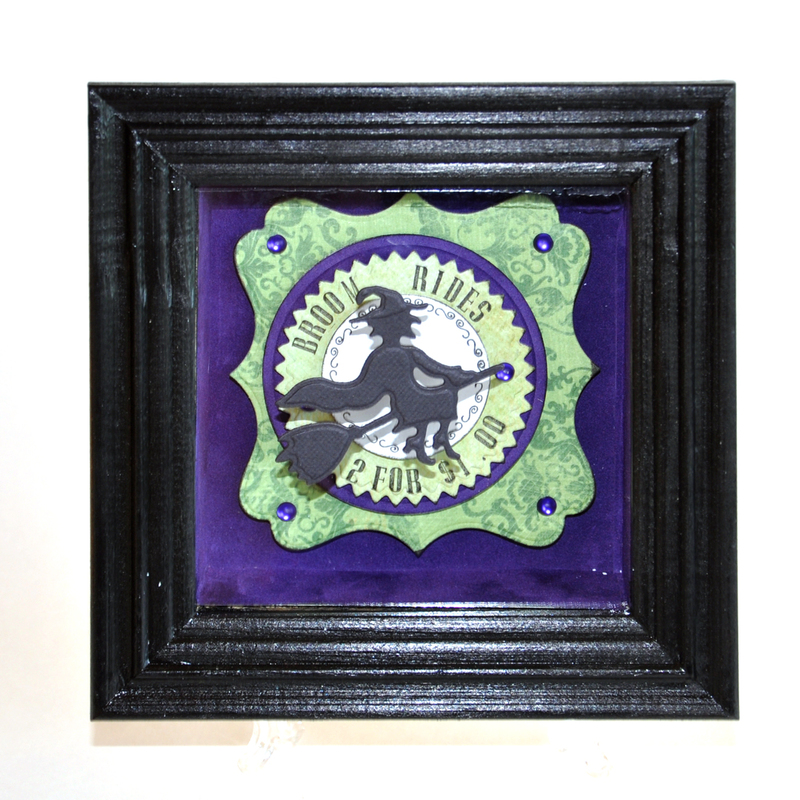 Flourishes will draw a winner and announce this coming Saturday, Ocotober 16, in their Winner’s Circle on their blog! If a peek didn’t whet your appetite enough, head on over to see what some of the Spellbinders and Flourishes designers whipped up today. I promise, you won’t be disappointed!! I created a 6-panel door using S4-142 Long Classic Rectangle LG #2 (the smallest is #1) to make four of the panels, and S4-128 Classic Squares SM #3 for the top pieces. I inked the edges and embossed lines with Distress Antique Linen ink, and adhered the panels with SCRAPBOOK ADHESIVES BY 3L 3D Foam Squares, to give them more dimension. 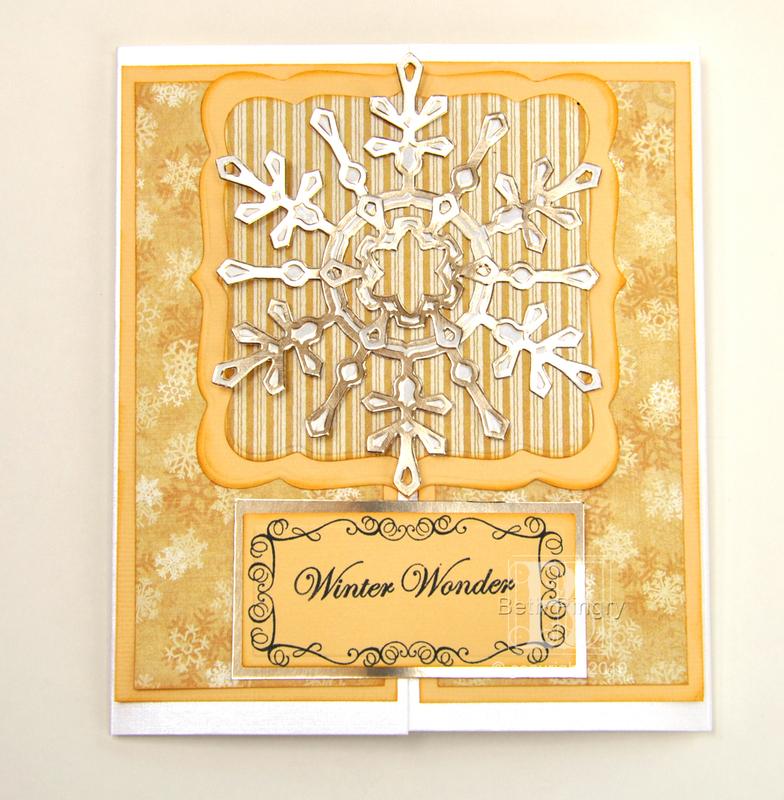 The door knob is a glitter brad from Creative Impressions, and it’s on the smallest die cut from S4- 283 2010 Heirloom Ornaments. All paper is from Worldwin. 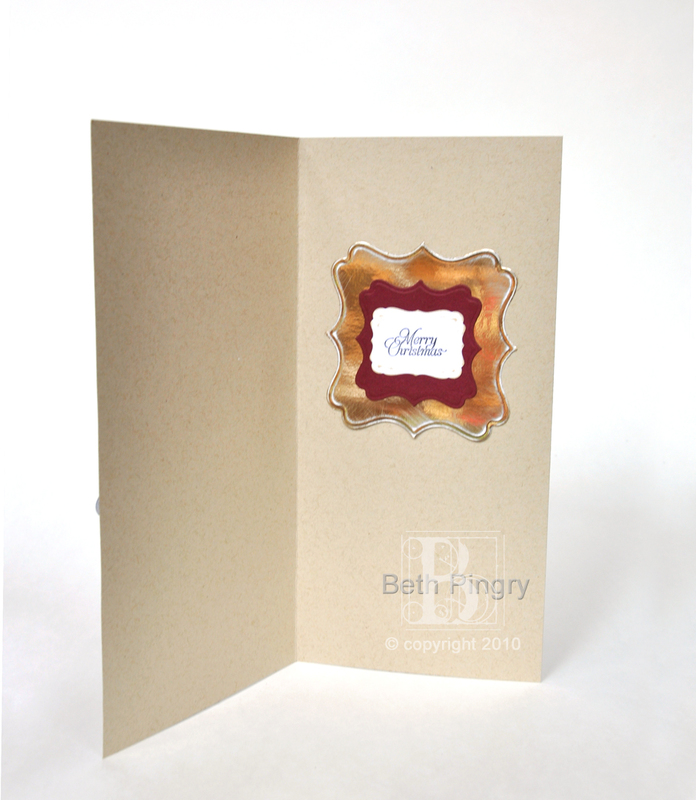 The inside has “Merry Christmas” stamped on S5-025 Labels Seventeen, and layered onto S4-301 Labels Sixteen. Taking a closer look at the wreath, you can see that it has three layers. 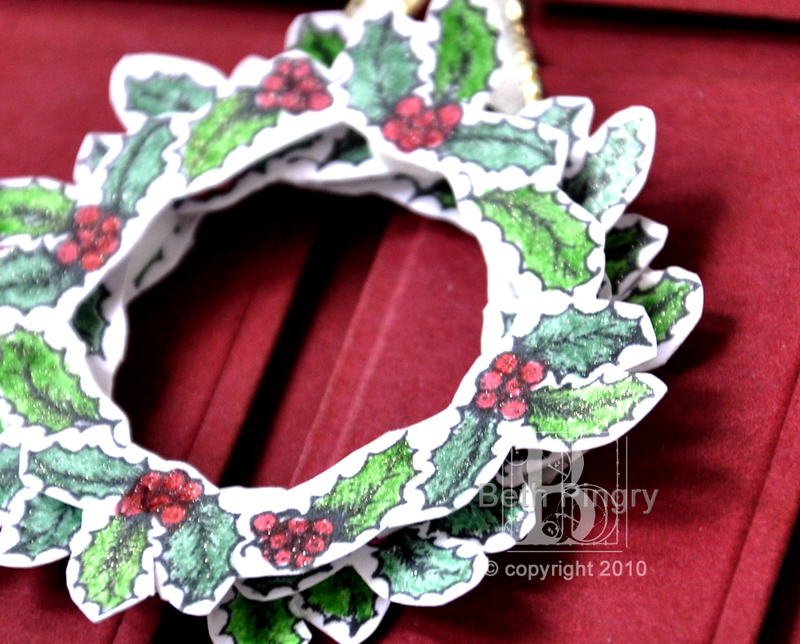 I stamped it three times and colored them with Copic atyou Spica pens, using Lipstick for the berries and Olive and Melon for the holly leaves. 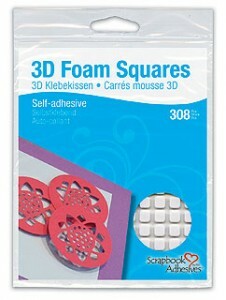 I hand cut and layered with 3D Foam Squares. Pictures just don’t capture the glittery delight of the pens, but belive me, its there! Thanks for looking! Enjoy the blog hop and don’t forget to enter to win on the Flouishes Blog! If you want to keep up with me, you can subscribe to my RSS and join Cookies for Breakfast on Facebook! 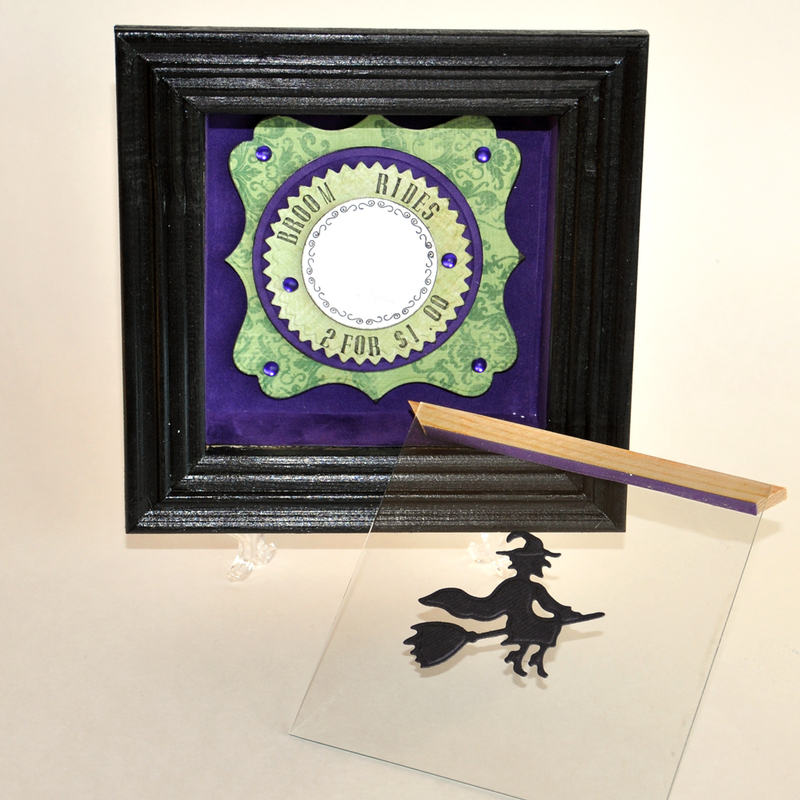 The glass slides out, so I put the flying witch on the front of the glass, it makes her look like she’s really airborne! 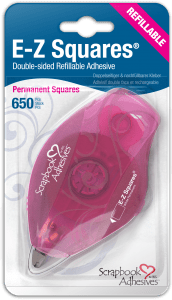 Adhesives are by SCRAPBOOK ADHESIVES BY 3L, of course, and the die templates are from Spellbinders, and the stamps are JustRite Stampers, to name a few supplies. And no, that’s not me on the front…but don’t go asking a certain teenager!